BUCHAREST (Romania), March 18 (SeeNews) - Romania current account balance showed a deficit of 114 million euro ($129 million) in January, compared to a gap of 7 million euro in the same month of last year, the central bank said on Monday, citing provisional data. The deficit on trade in goods widened by 476 million euro, while the surplus on primary income, that on secondary income and that on services expanded by 181 million euro, 141 million euro and 47 million euro respectively. 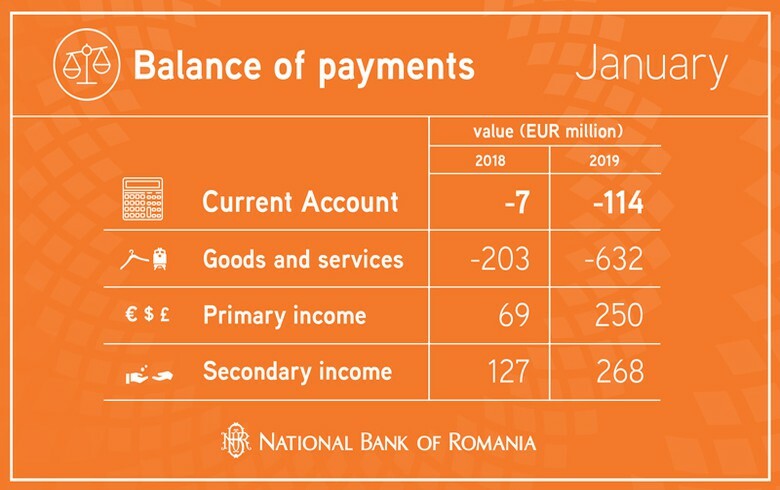 Romania's current account balance showed a deficit of 9.416 billion euro in 2018, compared to a gap of 5.970 billion euro a year earlier.